Robert Piguet Fracas Eau de Parfum, 1.7 oz. 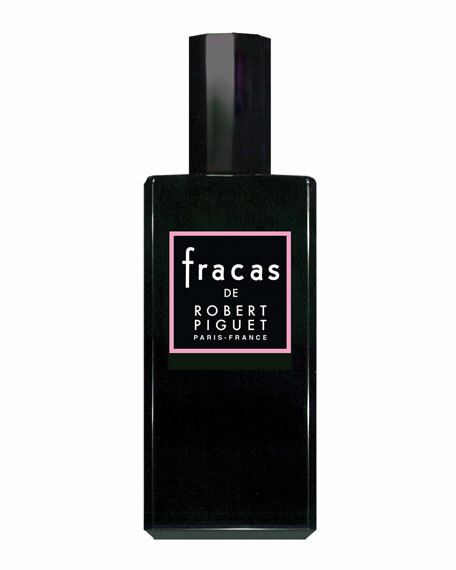 Robert PiguetFracas Eau de Parfum, 1.7 oz. Seventy years after its debut, Fracas by Robert Piquet still inspires legions of loyal admirers. This captivating fragrance abounds with tuberose, a white flower with a hint of orange, as well as jasmine, jonquil, lily of the valley, white iris, and a touch of pink geranium. Robert Piguet founded his haute couture house in 1933. It soon became famous for elegant and compelling creations, thanks in part to the talented designers whom Piguet employed and mentored (the list includes Christian Dior, Pierre Balmain, and Hubert de Givenchy). In 1944, Piguet introduced a perfume collection that continues to this day to capture the essence of luxurious Parisian style. The seductive, timeless scents of Robert Piguet endure trends, yet captivate the imagination of each new generation. Fresh Hesperides Eau de Parfum, 1.0 oz.